I would like to tell you that I made an incredible new recipe. Sadly this is not the case. Instead I am showing you what Kidlet will have tomorrow. It is also known as a Mommy-Doesn't-Feel-Good-Lunch. The good thing is it involves some of Kidlet's favorite foods so he doesn't mind that it isn't fancy. I don't like feeding him too many prepared foods but sometimes it's the only option so I try to at least make them good ones. 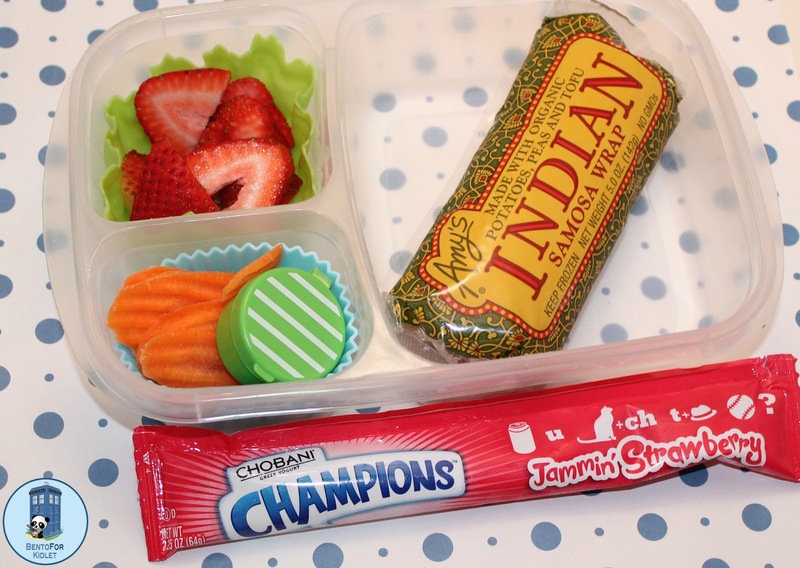 On the Side: Chobani Champions Jammin' Strawberry yogurt tube! That wrap sounds TASTY!!! I love the variety in this lunch. Thank you for linking to 15 Minute Fridays!